Federal government disassociates with private prisons. The Federal Government Is Finally Ending Its Use of Private Prisons. That’s Not Enough. 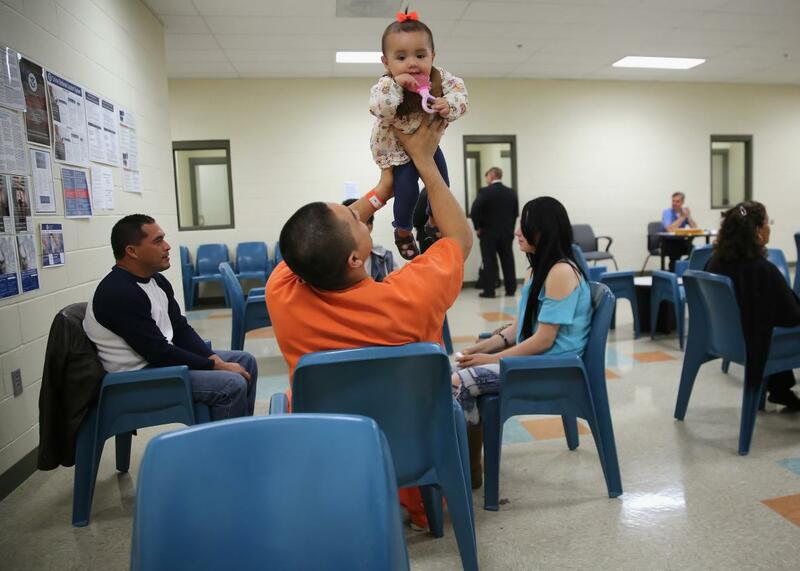 An immigrant detainee holds his daughter during family visitation at the Adelanto Detention Facility, a private prison. The Department of Justice announced on Thursday that the federal government will stop relying on private prisons to house inmates, phasing them out over the next few years. Because states will continue contracting with private prisons, Thursday’s move won’t dislodge them altogether from the American criminal justice system. But the DOJ’s vigorous criticism of the substandard services of private prisons undoubtedly marks a shift in the political landscape—and a considerable victory for undocumented immigrants, who arguably suffered the most from the federal government’s use of such facilities. Currently, private prisons house about 22,660 federal inmates, many of whom are immigrants awaiting (or appealing) their deportation. Because the detention of undocumented immigrants is so lucrative for private prisons, the industry has spent millions of dollars lobbying for harsher enforcement of immigration laws. Private prison lobbyists have focused on persuading Congress to maintain a federal quota that requires the detention of a certain number of immigrants at all times. These lobbyists have also spent millions on the state level to encourage legislators to pass draconian immigration laws that ensnare more immigrants and send them into the federal detention system. Of the 36 co-sponsors of Arizona’s unconstitutional 2010 immigration law, for instance, 30 had received campaign contributions from private prison companies and lobbyists. Private prisons are often touted as a deal for taxpayers, and the industry has heavily promoted the notion that they are less expensive to the government than traditional facilities. This contention, however, appears to be a myth. While industry-funded studies have found that private prisons are marginally less expensive, independent analyses have arrived at a different conclusion: These facilities cherry-pick their inmates, housing the healthier ones and passing along the “high need” (i.e., more costly) prisoners to government-run prisons. The DOJ’s recent report on private prisons, the impetus behind its Thursday announcement, noted the weakness of the industry’s claims of cost-effectiveness. It also confirmed what so many investigations have already found: Private prisons have serious “safety and security deficiencies” and have “incurred more safety and security incidents” than government-run prisons. “In recent years,” the report noted, “disturbances in several [private] prisons have resulted in extensive property damage, bodily injury, and the death of a Correctional Officer.” The facilities may also provide inferior medical services; in 2011, inmates at one private prison assaulted staff members after their allegedly negligent response to a medical emergency resulted in an inmate’s death. These centers must be civil, not punitive, in order to comply with the Constitution. But in practice, they’re often plagued by the same problems that spurred the DOJ to disassociate with private prisons. Thursday’s announcement, then, may be a considerable victory. But it won’t prevent the private prison industry from continuing to profit off immigration detention.